Ladies and gentlemen, let me introduce you to my friend, Adel Torres. We met in 2012 while training for The Bull Runner Dream Marathon. His story is such an inspiration to a lot of runners and has been featured in broadsheets and magazines. He is also a motivational speaker for TBR University. As of writing, he has finished four marathons including a world major, the Chicago Marathon 2014. One afternoon I decided to ask him some questions and even though he was busy, he was kind enough to answer all of them. Why did you take up running? How old were you when you started? I went to different gyms for the past 25 years and the only running I did was on the treadmill for 10 to 15 minutes as warm-up and cool down for my workouts. I started actively running (3 times a week) two months before turning 52 to lose weight and control my hypertension. I was a health risk, with blood pressure at 160 /100. I weighed 170 lbs. and my BMI was at the obese level. Two months after, I joined the Energizer Night Race 5K event with friends for fun. Our goal was to finish and get all the freebies. I had lots of fun and enjoyed it so I decided that I would join more 5K fun runs and move up to a 10K. My immediate goal then was to run a 10K race without walking. You attended several run clinics but TBR University has become dear to you having joined it twice. What area of your running did TBR-U most improve? TBR-U improved the way I trained for long distance running specially my running form, nutrition, hydration, and proper pacing at the start of the race. It was in TBR-U when I started using the Run-Walk interval and where I experienced power of a group in training. What was the best thing about being involved in TBR-U? It’s the camaraderie among fellow participants, the Dream Team, coaches, and alumni who “pay-it-forward”. It’s an incredible running community on its own where people share their experiences and stories and will help you finish your first or second marathon. What were the best advices did the Coach Jim, Coach Lit, and Jaymie give you? I also learned from him how to do progressive intensity training and speed work. I learned the Chi-running method from Coach Lit. He taught me the correct form, pacing and stride in running the hills, the run/walk interval training, and pacing slowly at the start of the race. 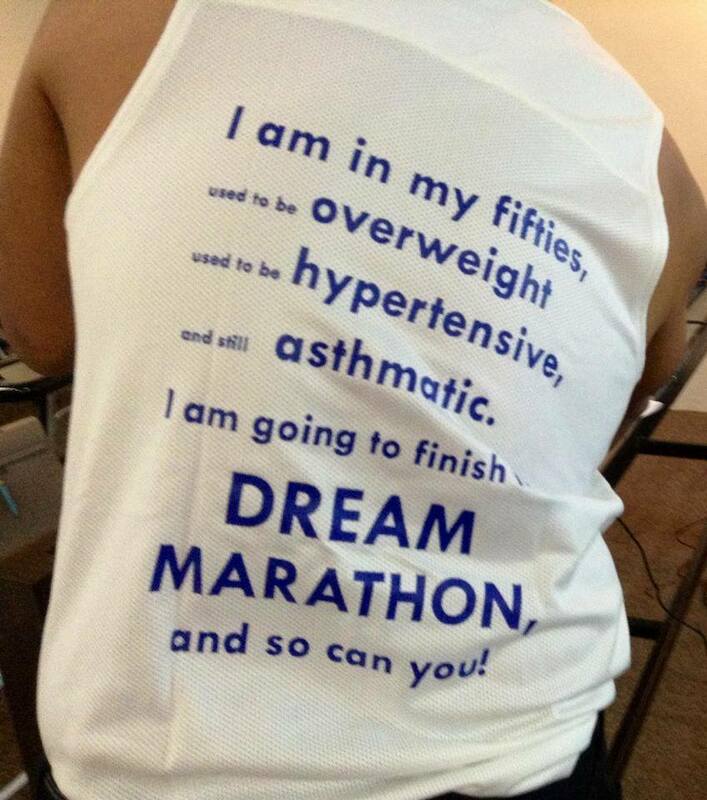 The marathon doesn’t define you. There are good marathons and there are the not-so-good ones, but, in the end, they are all the same. You cross the finish line better than the person you were when it started. What did you learn from nutrition coaches Armand and Mitch? Proper carbo-loading (with calorie count) before a long distance training run or race. 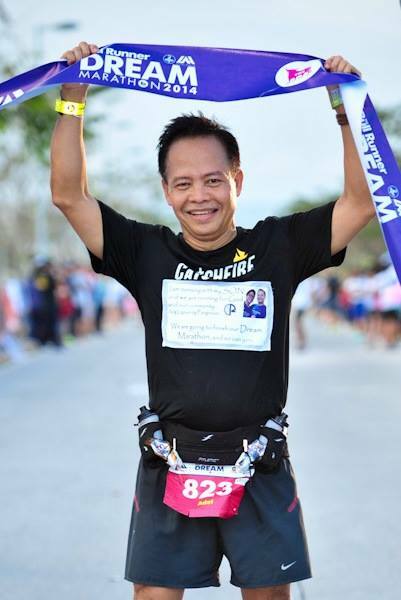 What have you achieved in running after TBR Dream Marathon in February of 2014? TBRDM 2014 was my 2nd marathon. I ran two other marathons: Milo last July, where I beat my TBRDM 2014 time by 11 minutes (with a negative split) and Chicago, where I beat Milo by 17 minutes (with a negative split)! I also ran two other 21Ks (Milo Lipa Qualifier and Bohol International) with new personal records and negative splits. Losing weight has helped me run faster and stronger. I have gone down from 170 lbs. in 2012 to 126 lbs. this month. What are your top tips for someone training for a marathon? Do the minimum 3 runs a week. (2 short runs and 1 weekend LSD) If you are too busy during the week to do the short runs, don’t skip the weekend LSD. If you are more advanced, try to run 4 to 6 days a week. Rest, recovery, and sleep are equally important as running. Listen to your body when you run. If something hurts and is troubling you, stop and have it checked or it might get worse. Practice, practice, practice your hydration, nutrition, lubrication, and what you will wear (nothing cotton) especially when you do your long runs (runs more than 20 km). Do not wear anything new for a race. It may cause chaffing and blister which will ruin your race. What kind of support did your family offer? They supported my healthy eating plan. We ate more vegetables, fruits, brown rice, and wheat bread. They let me sleep early in a quiet room because they understand that I have to run early in the morning. They’re ok that I’m not able to eat breakfast with them on weekends. They also cheered for me and were in the finish line in both my TBR Dream Marathons. They even woke up early to be in Nuvali. Some of them have also started running. My son finished TBRDM 2014 with me. Now my wife and sister joined TBRDM 2015. I have also signed up as a pacer to my wife. How did your Chicago Marathon performance go? It was one of the best marathon experiences for me. The weather was perfect, the roads were wide so there was no traffic among runners and the whole route had crowds cheering you on. I ran it 17 minutes faster than my 3rd marathon with a negative split of 3 minutes. It was a great way to see such a magnificent city and its residents. Describe the feeling of finishing a marathon knowing you’ve hit your target? Oh it felt awesome, like I was on top of the world. After finishing my first marathon, I felt I could do anything. That was the culmination of 5 months of intense training. Sleeping early on weekends to wake up at 2, start running at 4, and finish around 7 or 8 o’clock in the morning was all worth it. On hindsight, I also enjoyed the training; it is part of the journey to any marathon. I was dedicated and disciplined to my training plan and diet. I have hit my target for 3 out of the 4 marathons I ran. But just finishing and training for any marathon is always a memorable and life changing experience. I hope to do it twice a year. As a runner, what is your ultimate dream? My ultimate dream is to run a marathon with one of my grandchildren; I believe I might be 80+ by then, God willing. Wow! What an inspiring blog! Thanks for sharing! Thank you. Yes, Adel’s story is inspirational.